This means we have 140 blocks. Each block's size is 512KB ==> 512 * 140 = 71,680 ~= 70KB is the limit of file's size in xv6. I want to implemet triple indirect access in xv6 in order to support files with size of 40MB. In order to do it I will need to implement double indirect before the triple indirect. So I took 2 directed blocks from the 12 I had. 1 for the double indirect and the other for the triple indirect. So I understand the concept. The implementation of the triple-indirection is in function bmap in file fs.c. // On-disk file system format. // Both the kernel and user programs use this header file. // Block 0 is unused. // Block 1 is super block. // Blocks 2 through sb.ninodes/IPB hold inodes. // Then free bitmap blocks holding sb.size bits. 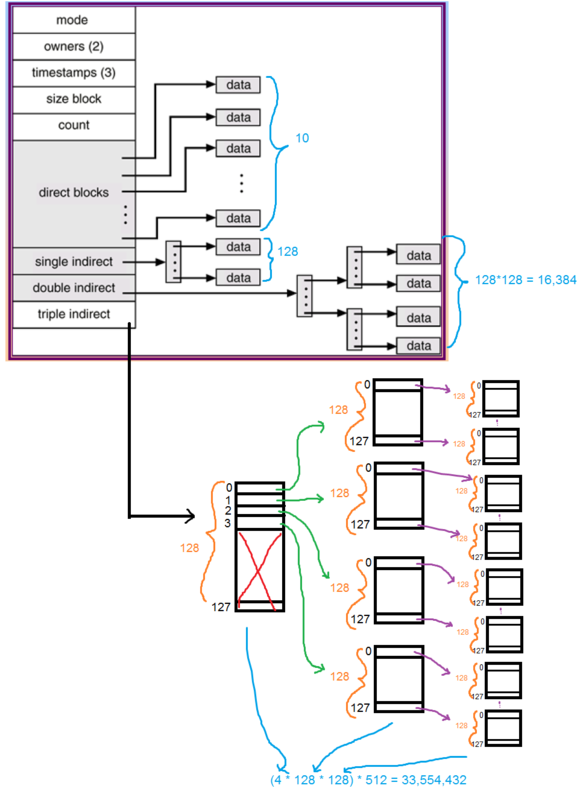 // Then sb.nblocks data blocks. // Then sb.nlog log blocks. uint ninodes;      // Number of inodes. // Directory is a file containing a sequence of dirent structures. // Return the disk block address of the nth block in inode ip. // If there is no such block, bmap allocates one. // Load indirect block, allocating if necessary. // Load 2nd indirect block, allocating if necessary. // Load 3rd indirect block, allocating if necessary. printf(1, "usage:\nfiles <name> <letter> <num>\n"
1.The number of nblocks which is defined in mkfs.c is insufficient. which equals: 10+128+128^2+4*128^2 = 82058. Just pick a number of nblocks which is greater than 82058, and update size accordingly. 2.In your bmap() function, in the triple indirection code, your first level of indirection is to a four-entry array (as you mentioned in your diagram). Once you know to which of these four entries you should access, you're back with the double indirection problem, which you already solved. and solve the double indirection problem again.